The Great Messenger Abraham's life reminds us the place of sacrifice and how those who have gone before us were tested to their highest for sacrifice and it was through transcending those tests he became what he became. This is the month of Dhul Hijjah which has begun now (starting from 17th Oct, 2012), a very sacred month in the Islamic calendar, in which the Hajj (pilgrimage) takes place. On its marked three days, a greater portion of humanity around the world will honor the sacrifice spirit of Abraham, the greatly illuminated being, upon whom be peace through symbolic sacrifice of animals. In Islam, just as Abraham's vision of sacrifice was confirmed with a Ram or Lamb, in following the footstep of Abraham, it is recommended in Islam to give sacrifice of an animal as an established and accepted form of worship. The history of Sacrifice or offering to God has been as ancient as human being on earth. From Adam's sons to Abraham, we are told about their ritual sacrifices. It is acknowledged that sacrifice for the sake of Divine was practiced universally in every age and tradition. It is the practice of the sacred tradition that one give away one third of the meat among the needy, one third of the meat to one's relatives and may share the remaining one third with his or her family. Isn't the reality of Sacrifice means Inner Sacrifice? Then why the ritual and animal slaughter? Yes it is true that the practice of blood sacrifice or sacrifice of the animal is meant to sacrifice the inner animalistic attribute of human being. From the Biblical and Quranic story of Abraham, sacrifice was in the context of sacrificing that thing which is precious to one, for which one has a great affection. For Abraham it was his son. Apart from one's family, man also has affinity or attachment with property, fame, dignity, social status- and so forth. Whatever it can be, one should sacrifice it for the sake of God, this is the spirit of sacrifice. Everything that has an inner reality, if not preserved through its counter part of it's outer reality and practice, then the wisdom teaching which is part of the inner reality gets lost over time. We have many historical evidences that will testify this that when the outer forms which hold and work as a container of the inner teachings and symbols are discarded, then even the inner reality is lost over time. The Bauls sing, "Elim Shikle Alim Hoyna Amol Na Hole," which closely translate as, "Just learning knowledge does not make one enlightened unless knowledge is made into practice through action." Just as it is true for individual that knowledge is not put into practice is not knowledge at all, similarly for the preservation of spirituality reality, its outer manifestation through rituals, through practices in the world world must manifest because it is these forms within which its spirit are kept alive. From this perspective, the practice of sacrifice is essential to be preserved for through this outward practice of the sacrifice of an animal, human beings are reminded the sacredness of life, the necessity of sacrifice as a core value and also the reality of honoring the symbols of God. And whoever honors the symbols of Allah - indeed, it is from the devotion of hearts. Every inward (batin) has its complementary outward manifest (zahir) and every outward is sustained by its inward, just as the physical body is operational because of the existence of the soul giving it the life-energy. Sacrifice of animal is the outward action as a reflection of the inner reality of true sacrifice of the self for the Friend, as exemplified by Abraham, a friend of God and mighty Messenger, may God bless him. Even though one sacrifices animal as a symbol and a living symbol that is, a sacred symbol of a living life sacrificed for the sake of God, yet the Scripture reminds us that it is the consciousness of God which ascends to the Divine, not the flesh and blood. Their meat will not reach Allah , nor will their blood, but what reaches Him is devotion from you. Thus have We subjected them (the sacrificial animals) to you that you may glorify Allah for that [to] which He has guided you; and give good tidings to the doers of good. So eat thereof, and feed the miserable poor. Last year few friends and well wishes from abroad requested me to sacrifice few animals on their behalf and distribute the meat to among those who are needy, to orphanages which we did and we thank God for giving us that opportunity to serve. It was a good experience by the grace of Allah that many poor families and even orphanages where orphans reside were the beneficiaries of such effort. It was small step but any action that is for His sake, benefiting His creation is a sacred act and we pray that this action is accepted by Him. This year we have made an intention from Porshee Foundation that with help of our local friends we will also facilitate to offer Sacrifice / Qurbani / Udhiya one behalf of those who are willing to have this to take place and be distributed entirely among the needy and poor ones. 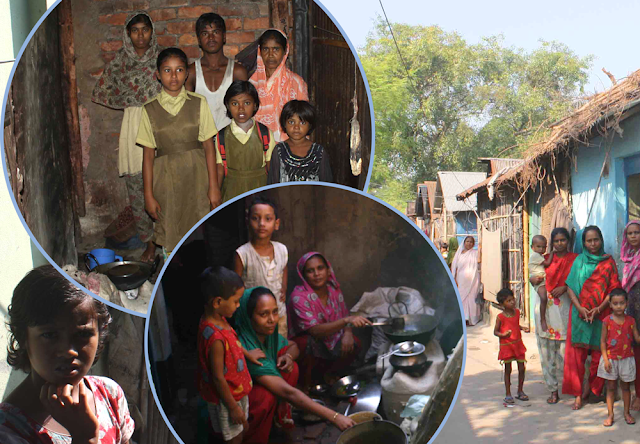 God willing, the beneficiaries we are mostly choosing from poor areas of Bangladesh including the Northern part which suffers the most from poverty. We are preparing logistics to have the Sacrifice in Saidpur, Rangpur in Northern Bangladesh. 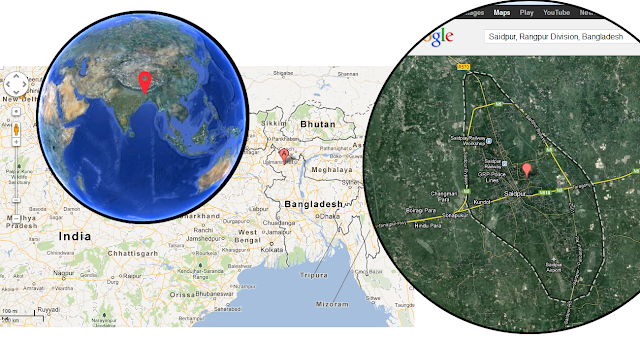 The graphics below shows its location (click on the image to view in Google Map). We hope to buy either goats or cows (the two kind of animals which is common to be sacrificed in this part of the world due to their availability) and sacrifice them on the Day of Eidul Adha which is most likely to fall on 26th October this year. We have about 10 days in hand. Here in Bangladesh, a medium sized goat will cost approximately 120 USD or for a medium sized cow it will cost approximately 250 USD. 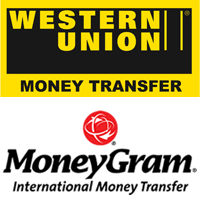 If you decide to pay via Western Union or MoneyGram all you need to do is after your payment is made (equivalent of 120 USD or 250 USD or any amount in between), please note the Reference Number generated and equivalent amount mentioned there in my currency (which is Bangladeshi Taka or BDT). If you please email me sadiq.alam@gmail.com these two information, I could collect the money from here on the very day or next. Visit Paypal website and send the contribution to this following email, techofheart@gmail.com. Any amount between 120 to 250 will be good. Please also mention any person's name for whom you wish this sacrifice to be done so that it shall be spelled out during the sacrifice. You're also welcome to donate any other amount which will be used towards the feeding of poor in this Festival Season. Even if you can not or will not participate in this, please remember the poor and less fortunate ones in this Festive Season. So whoever does good equal to the weight of an atom, shall see it. And whoever does evil equal to the weight of an atom, shall see it (on the Day of Recompense). Blessed and accepted be our sacrifices! True love grows by sacrifice. There are certain values which when embraced and embodied, transforms 'a human animal' into 'a true human being' and likewise which when forgotten and obscurely buried under distractions of ten thousand things confirm the descent of human being into a talking animal or worse. The Divine Power has certainly created man of the best of stature. Then with Divine mechanism man is also rendered to the lowest of the low. Sacrifice is one such value that elevates man to the best of spiritual stature. The stem of greatness sprouts from the seed of sacrifice. Seva (service), love and sacrifice are the basic prerequisites for human development. When we hear the word 'sacrifice', we often think of completely selfless acts in which someone does something for another entirely for the other person’s benefit. 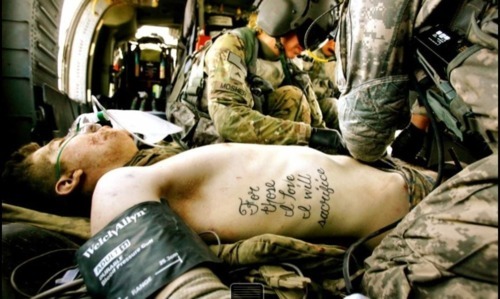 The image of a soldier sacrificing his life for his comrades frequently comes to mind. But sacrifice isn’t purely altruistic. The best definition of sacrifice is this: “To forfeit something for something else considered to have a greater value.” (American Heritage Dictionary). Sacrifice does not mean giving up something for nothing; it means giving up one thing for something else we believe is worth more. To sacrifice is to give up something precious in order to gain or maintain something. This does not at all take away from the virtue of sacrificial acts. Instead of locating the merit of sacrifice in unselfishness, we can find it in a man’s chosen value system. The man who lays down his life for his family or for his comrades has chosen to place more value on their lives than on his own. The law of sacrifice says that you cannot get something you want, without giving up something in return. In order to attain something you believe is of greater value, you must give up something you believe is of lesser value. Society today tries to deny the law of sacrifice at every turn, promising people that they can fulfill their desires without having to forsake anything at all. “Lose weight without giving up your favorite foods!” “Get ripped without long workouts!” “Get rich without having to work hard!” The denial of the law of sacrifice is at the heart of things like our soaring credit card debt, not to mention national debt. The fantasy that you can have whatever you’d like without ever paying for it is an incredibly seductive fantasy. Does man think that he will get whatever he wishes? If you want to lose weight, you have to give up junk food. If you want to be in good shape, you have to work out regularly. If you want the nice things in life, you have to work hard and save your money. Sure, sometimes fame and good fortune seemingly drop into someone’s lap. The law of sacrifice is not as irrevocable, as say, the law of gravity. But as Frederick Douglass said: “A man, at times, gets something for nothing, but it will, in his hands, amount to nothing.” For proof of this, see the cases of folks who win the lottery and then squander it all away. The essence of generosity is in self-sacrifice. First, the denial of the law of sacrifice keeps a man from progressing in life. To reach one's goals, one must move forward, which necessitates leaving some things behind. But the man who believes he can get whatever he desires without sacrifice tries to hold onto everything in an attempt to have it all. Instead of moving forward, he is stretched out horizontally and sitting on the fence. Failing to understand the law of sacrifice also leads to a life of restlessness and regret. When one believes one can have whatever one want, without giving up anything in return, one can never fully embrace and enjoy his, her choices. Great unhappiness arises when we fail to acknowledge the necessity of sacrifice and subconsciously hold the idea in our heads that we can have both things at the same time. There are trade-offs in life and that you can’t have one thing without giving up another. So that was in general look at the value of Sacrifice in our day to day life's reality. The spiritual traditions also holds sacrifice with great value. In fact, from spiritual perspective without sacrifice, no spiritual progress can be made in the path. The Path of Surrender is all about sacrificing our own agenda and embracing wholeheartedly the Divine Agenda. Another definition of sacrifice is to deny self when self (ego) really wants to come first. 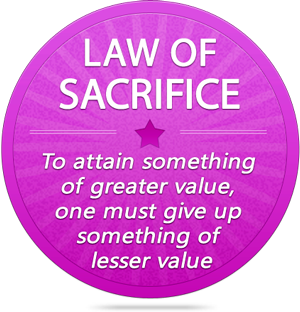 What is the value of Sacrifice and the Law of Sacrifice? 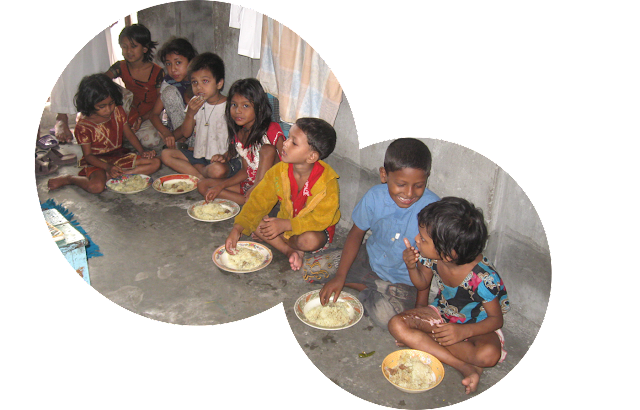 In this post you're welcomed to contribute or make request to offer sacrifice on your behalf and distribute the meat among poor families in Bangladesh.